A series of crashes – two involving semi-trucks – resulted in several injuries and one death early Sunday morning on Interstate 5 near Grand Mound, according to the Washington State Patrol. The crashes began around 4 a.m. The first involved a semi-truck and three other cars, police said. Only minor injuries were reported in that crash. The second collision happened because of the backup from first crash. A truck towing a trailer went down an embankment. An unknown number of other cars were involved in the second collision, and only minor injuries were reported. The third accident, which resulted in a fatality, happened as a result of the backup from the first two crashes. Police said a semi-truck driver was trying to slow down when he hit two vehicles. The driver then swerved and hit a Hyundai Accent, killing the occupant of that vehicle, 61-year-old Jeffrey Kragness of Rochester. The semi-truck swerved again and hit three more vehicles. The third crash involved seven vehicles in total – four semi-trucks and three cars. With the northbound lanes on I-5 shut down, there was a fourth crash. The at-fault driver was arrested on suspicion of DUI after hitting a woman’s car, sending her to the hospital with unknown injuries. It’s no secret that semi-truck accidents are serious, and unfortunately many of these crashes result in horrific injuries or death. According to the Insurance Institute for Highway Safety, about one in 10 highway deaths occurs in a crash involving a large truck. In the case above, the traffic backup from the first two crashes is not a valid excuse for the semi-truck driver in the third crash who caused the death of the 61-year-old man. Drivers are expected to travel at a safe speed for the conditions and keep a close eye on traffic, giving themselves enough time to stop. The team at Davis Law Group, P.S., has a strong track record representing victims and their families in accidents involving semi-trucks. The attorney you hire should be familiar with state and federal trucking regulations. These cases are often complex, and getting the best possible result usually means not settling quickly. Make no mistake: the trucking company’s insurance will defend their case fiercely. 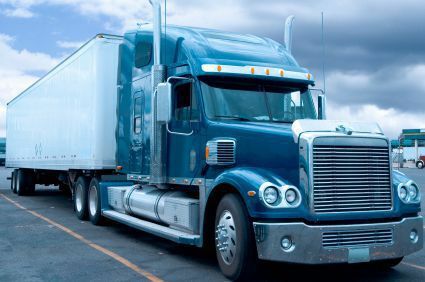 Because semi-trucks are huge vehicles that often carry valuable loads, they are usually heavily insured. In cases involving semi-trucks and other commercial vehicles, accident victims have told us they’ve seen investigators from insurance companies arrive at the scene of the crash before police. Millions of dollars can be at stake, and having someone equally committed on your side in these cases is vital. Attorney Chris Davis has over 25 years of experience involving semi-truck accidents. 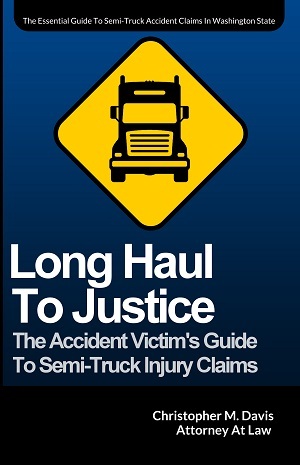 He’s written a book detailing the nuances of the accidents and what laws may apply. If you’re looking for an experienced legal team that is prepared to handle a complicated commercial vehicle accident case, contact Davis Law Group at (206) 727-4000 or use the form on this page.